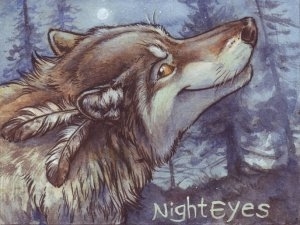 NightEyes DaySpring is a known troublemaker who is rumored to have a penchant for coffee and an interest in dead, ancient civilizations. He has been actively writing furry fiction since 2010. His stories have appeared in Werewolves vs. Fascism, Seven Deadly Sins, and FANG, along with other anthologies. He also co-edited Dissident Signals, an anthology of dystopian furry literature. Currently, NightEyes resides in Florida with his boyfriend, where in his spare time he masquerades as an IT professional.